My hometown got hit pretty hard by a tornado the other day. I called my parents and they're ok, but the town is a mess. Close family friends lost their home. So yeah, it's really bad down there. If you can, please donate a little money to help relief there. I can't find any donation site that will go specifically to tornado relief, but the Red Cross does have it's regular donation site running. 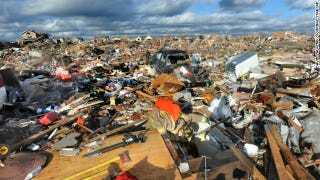 You can call over the phone and specify that you want your donation to got to Central Illinois Tornado Relief. You can also send money by mail if that's more your thing. If you can't give, thoughts and prayers are more than appreciated. Update: I'm still looking for a means to directly donate to the tornado relief. It seems most landlines are down, so it's hard to make calls to the local charities I know. Right now that Red Cross site is the best I got. Update 2: You can donate to the Salvation Army. The funds go to those in Central Illinois who were hit the hardest. Heroes Memorial Foundation also has a site where you can donate, though the money is specifically for law enforcement and emergency response personnel in the area as well as families who are victims of the tornado.